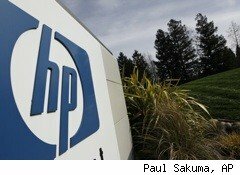 Late Tuesday, PC maker Hewlett-Packard (HPQ) forecast a healthy growth in earnings and sales for fiscal 2011, as the company expands into consulting and computer security services. But the company gave no hints as to who its new CEO may be, almost two months after Mark Hurd stepped down following allegations of abusing his expense account. Interim CEO Cathie Lesjak told analyst that HP expects earnings per share of $5.05 to $5.15 for the fiscal year ending October 2011, The Associated Press reported. That range, which does not include certain accounting items related to recent acquisitions, represents an increase of as much as 14% from this year. Lesjak also forecast revenue between $131.5 billion to $133.5 billion, an increase of 5% to 7%. Lesjak said the company has been considering both internal and external candidates for the CEO slot. She did not give any sign as to when the board might announce a decision.